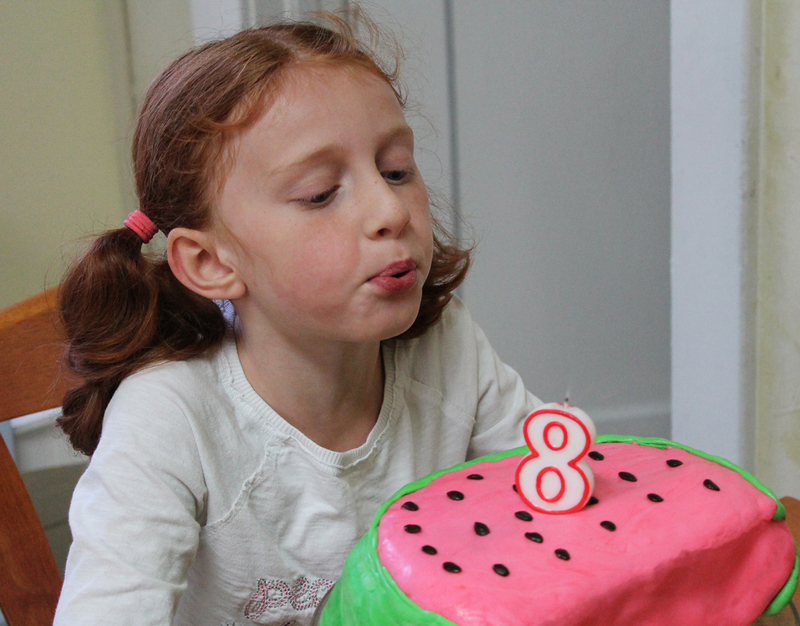 Eight | Live. Learn. Love. Eat. 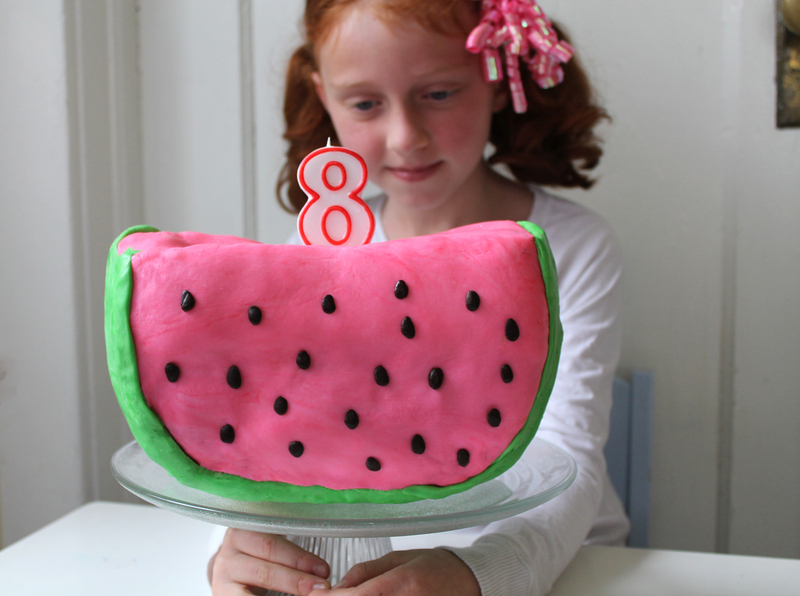 For her birthday cake this year I decided to make a watermelon cake. Autumn loves watermelon, so I thought this would be a nice idea for her. 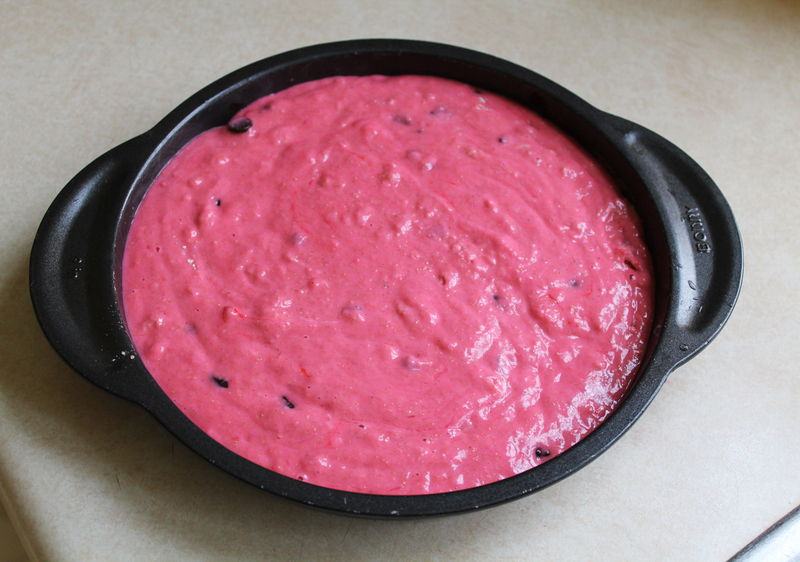 The cake I made was whole wheat vanilla cake colored with pink food coloring and I added 1/2 cup dairy-free chocolate chips to the batter to make watermelon seeds. 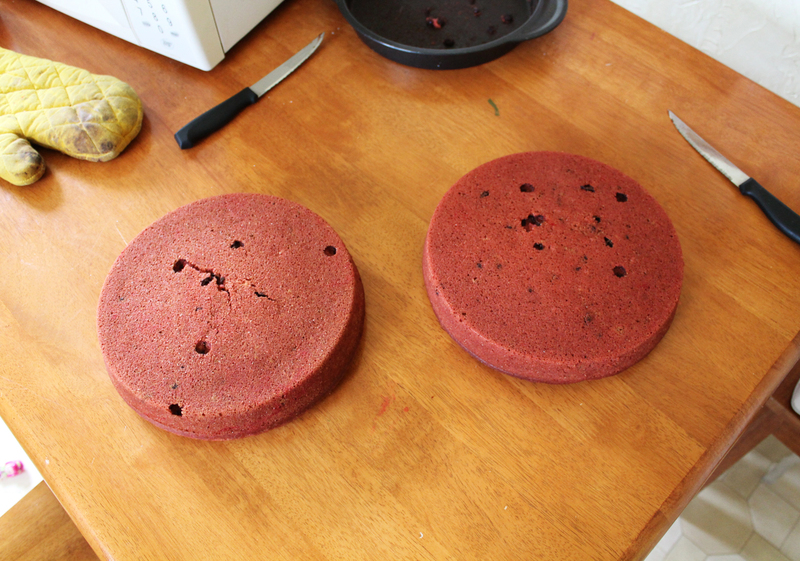 I made two 9-inch cakes so that the cake would be two layers thick. 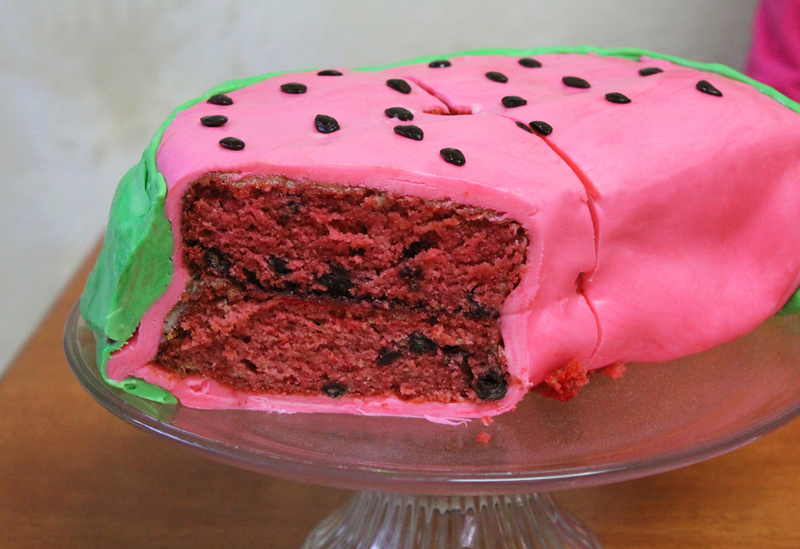 You could just make one cake, cut in in half and then place the two halves together to make two layers, but I wanted my watermelon a bit wider, so I cut the cakes a little bigger than halfway. 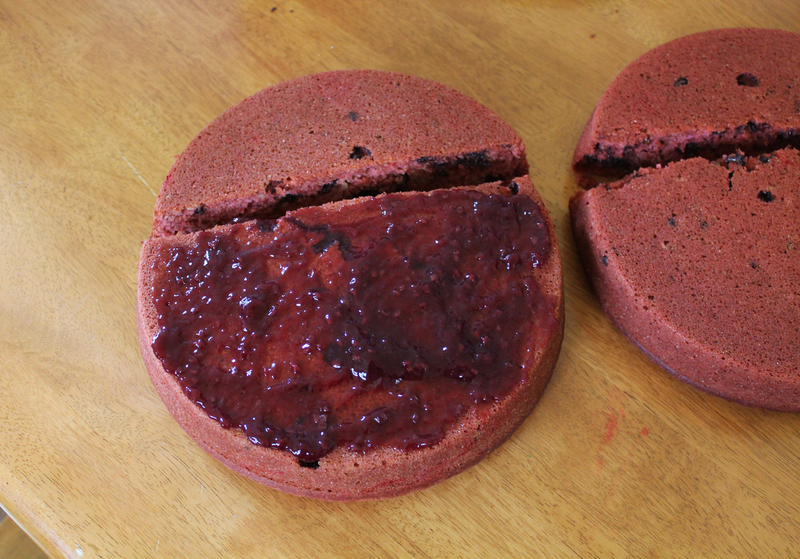 I then stuck the two cakes together with jam. 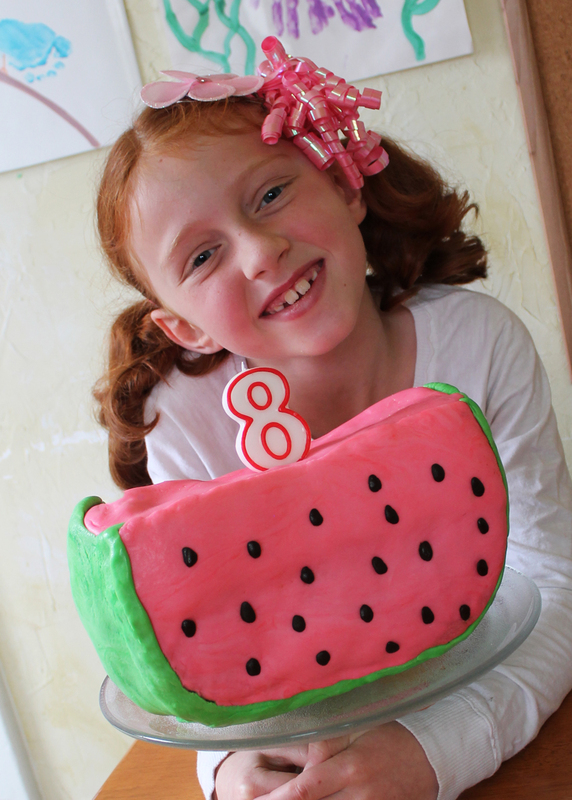 Next, I frosted the cake with a layer of vanilla frosting and then layered on the vegan marshmallow fondant icing. 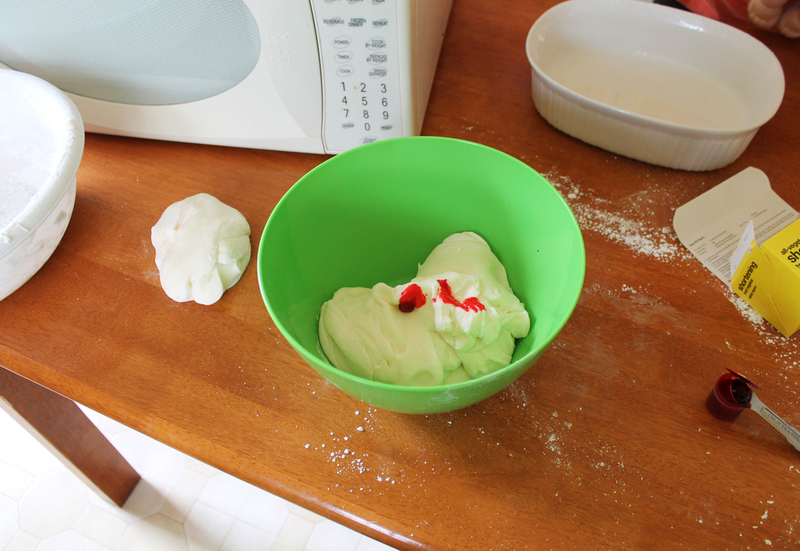 I had made the marshmallow fondant icing before I made the cakes so that everything would be ready to go. 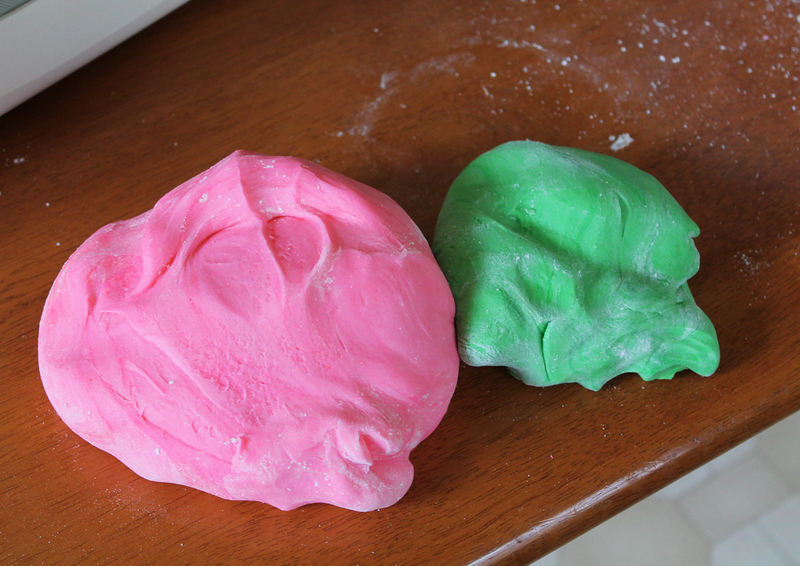 I colored the icing pink for the watermelon, green for the rind and brown for the watermelon seeds. 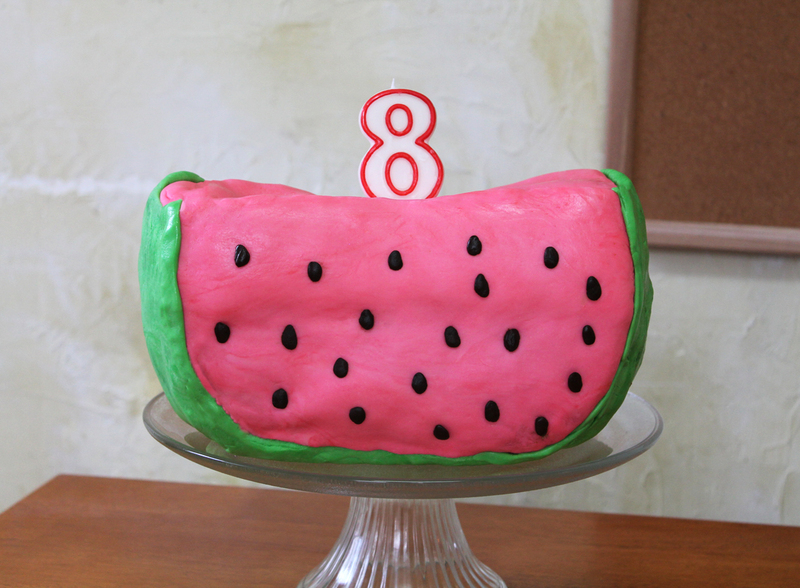 Finally I decorated the cake by adding the green watermelon rind and stuck on some brown fondant for the watermelon seeds. 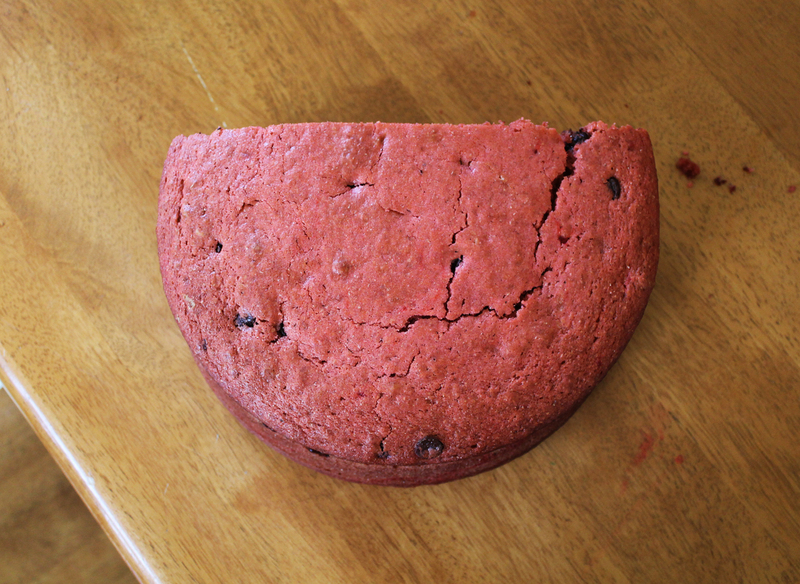 I then placed the cake into the freezer to harden a bit so that I could stand it up and take a picture. 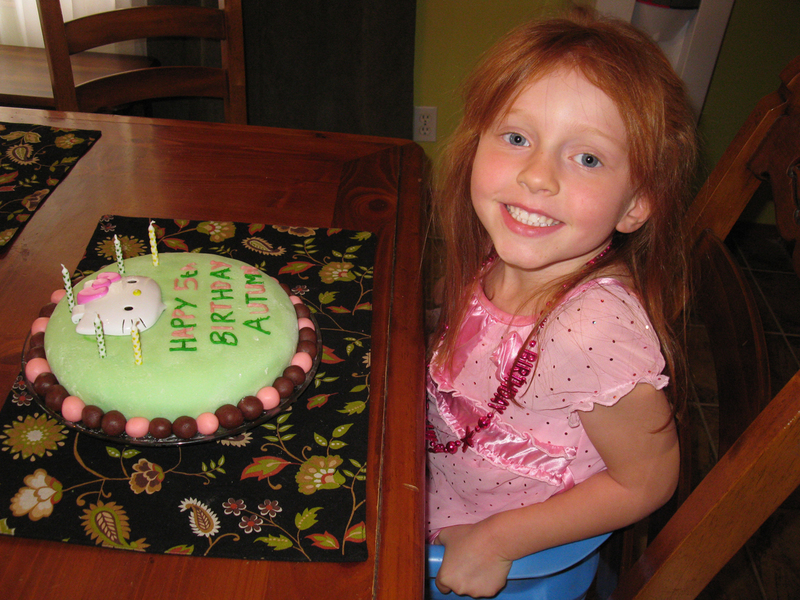 I really didn’t want to make another fondant cake because they are so time consuming and not so healthy with all of the sugar and coloring, but she had her heart set on the fondant and so I had to make it for her to be fair since I had made Kesa one this year on her birthday. 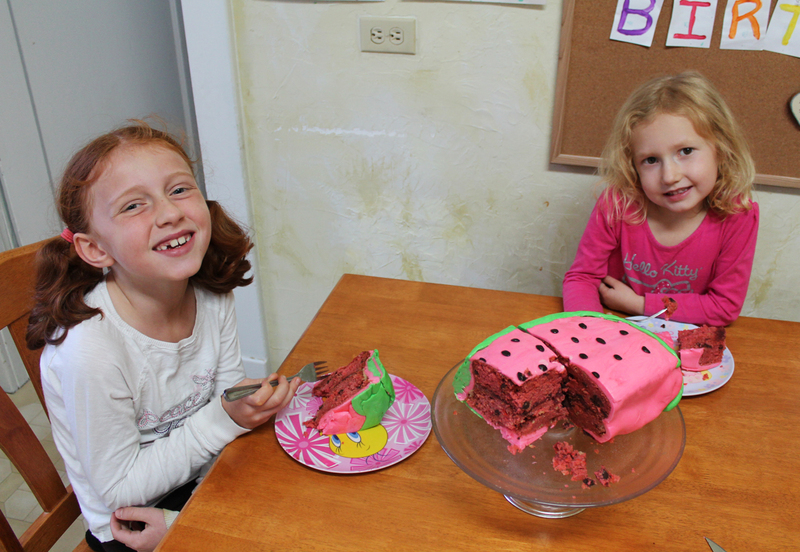 These fondant cakes are always a super sweet treat to my girls since they don’t often have sugary treats. 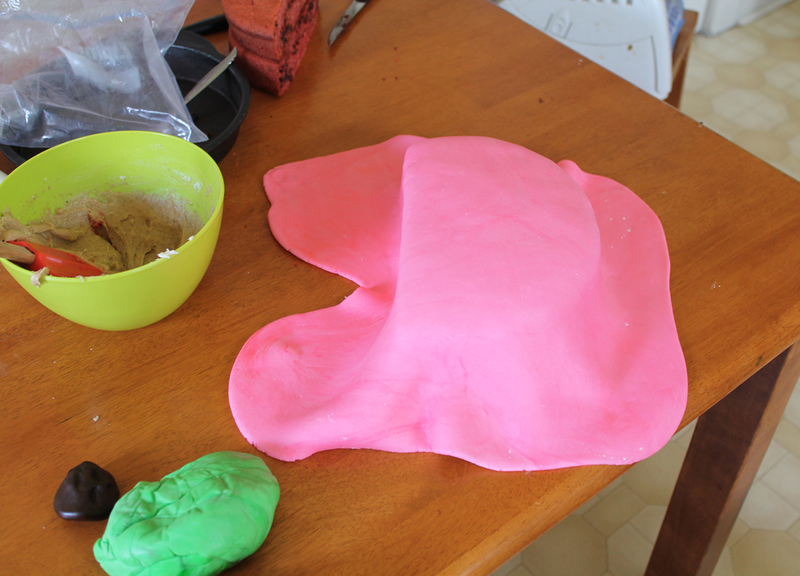 I figure that this will be my last fondant cake, at least for a while anyway. 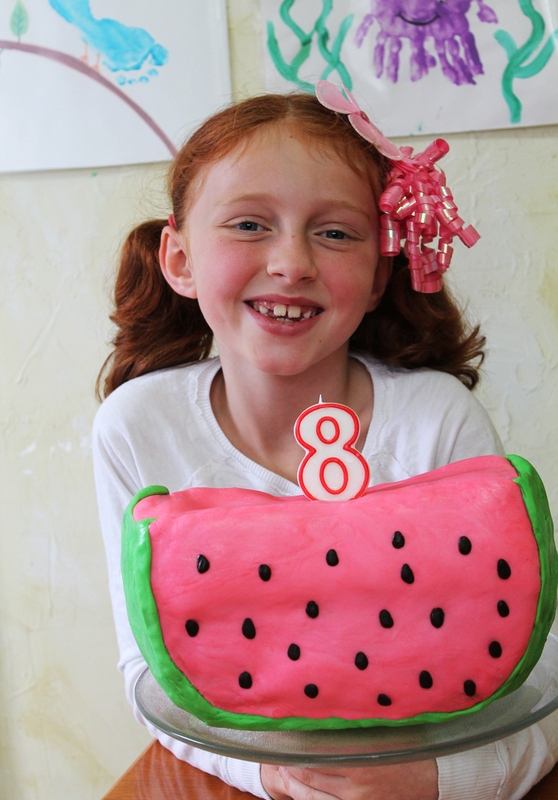 Happy 8th bday Autumn, have a wonderful day .What a special cake you have, that cake looks amazing , what a fantastic and fun idea, happy day ! Well done Tiffany. 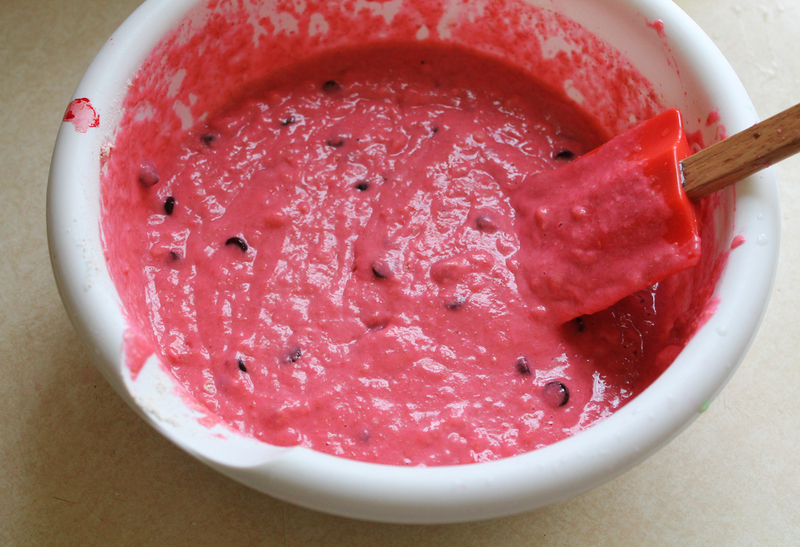 Your cakes always look amazing. Autumn would’ve loved it! This cake looks fantastic! 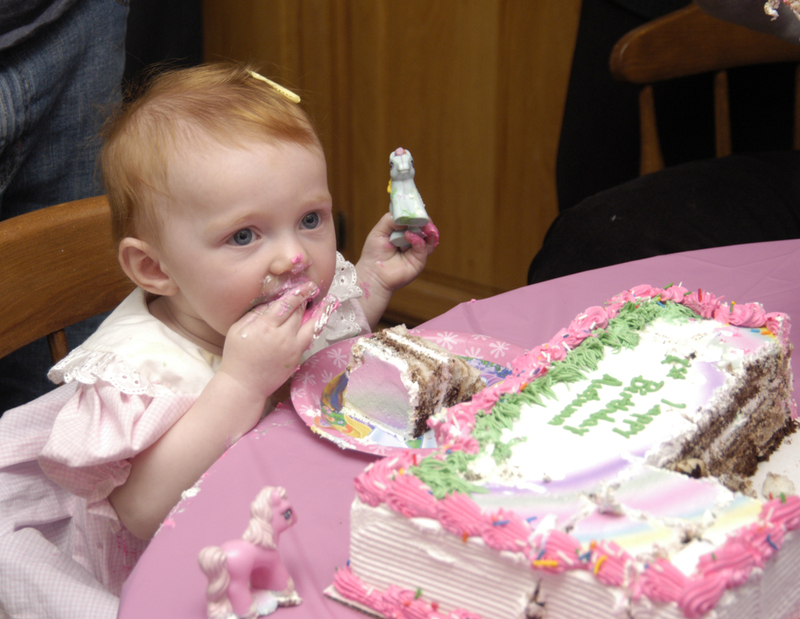 I really like the Strawberry Shortcake themed cake also. You’ve got skills! 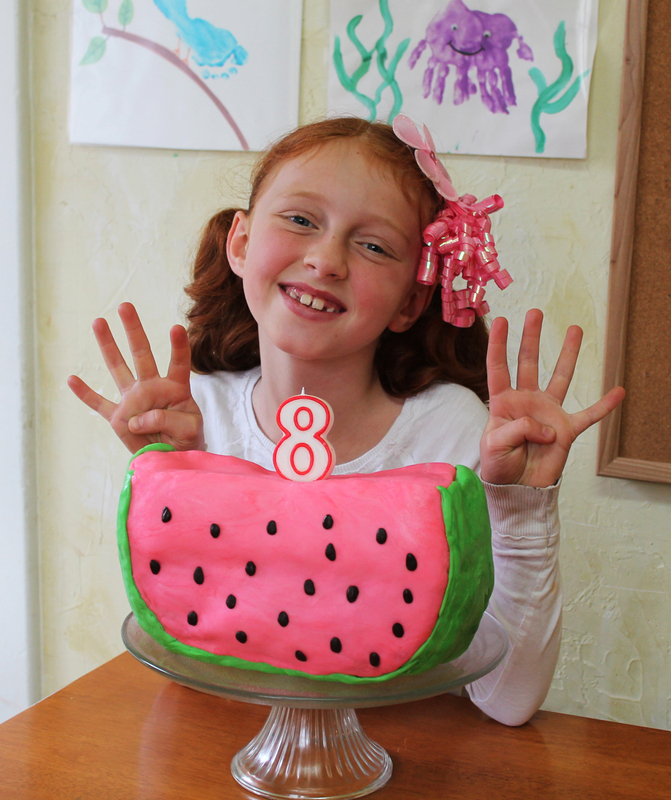 Pingback: Eco-Friendly Birthday Party Tips and Vegan Fondant Birthday Cake | Live. Learn. Love. Eat. 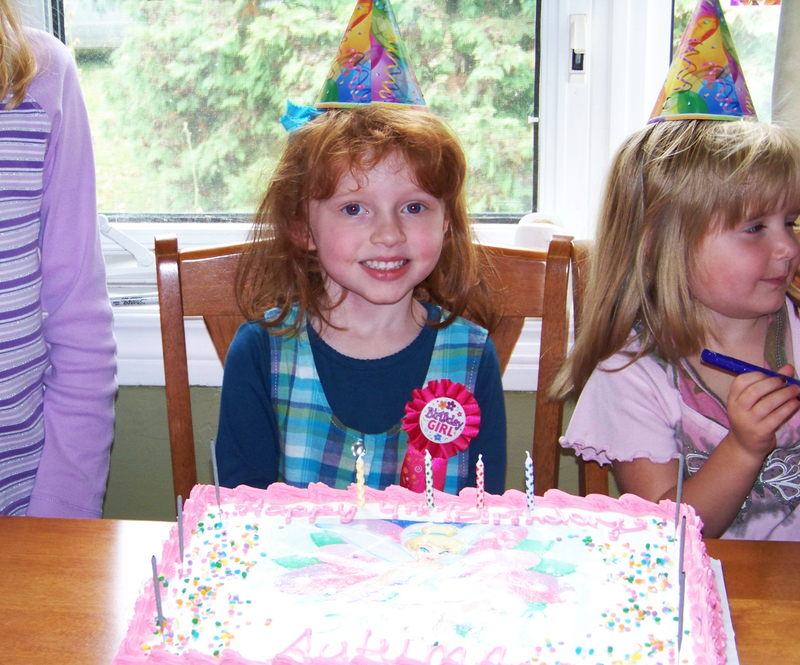 Wonderful birthday wishes to Autumn, hope she had a wonderful day. The cake is amazing! very nice! And one lucky young lady! 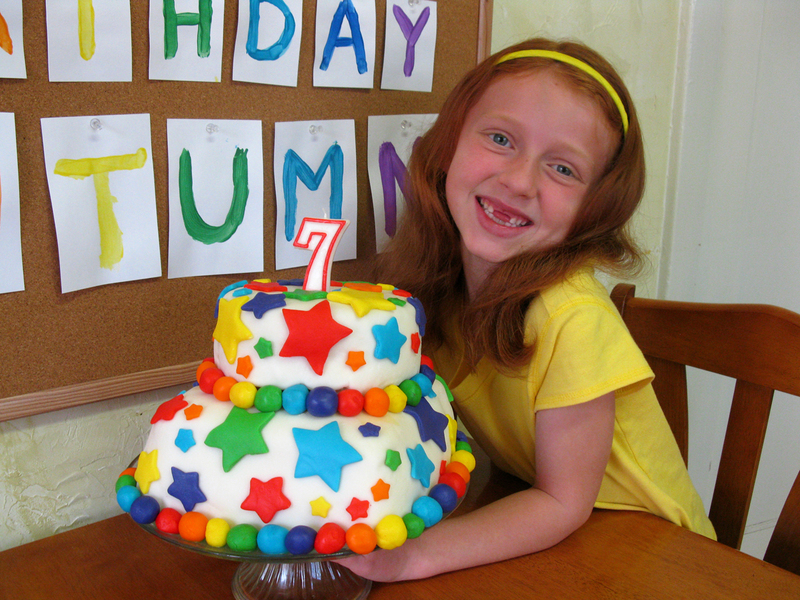 Great idea for a cake! 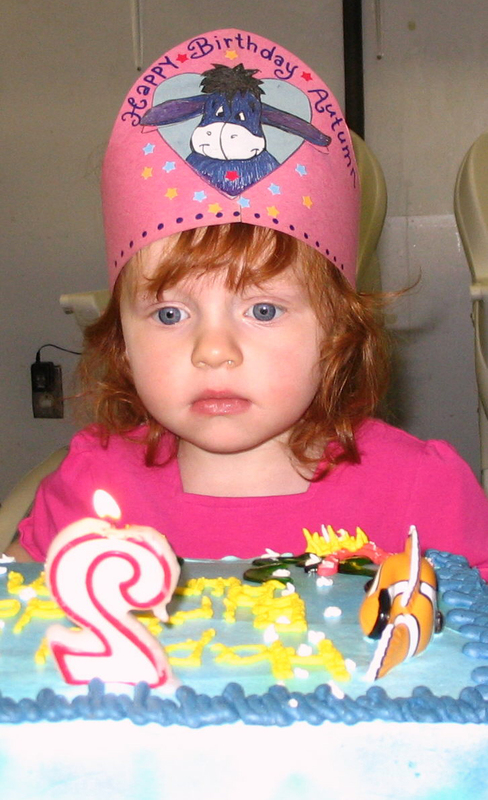 It’s super cute… Love the birthday timeline pictures. 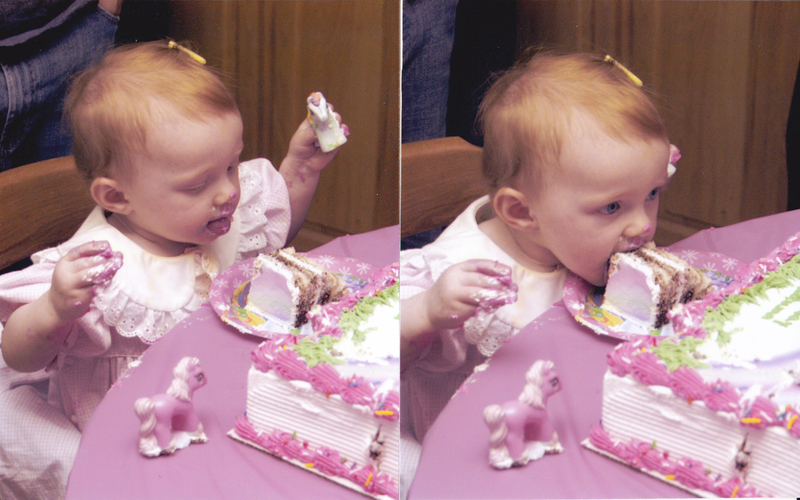 From her first birthday, you can tell who she is. 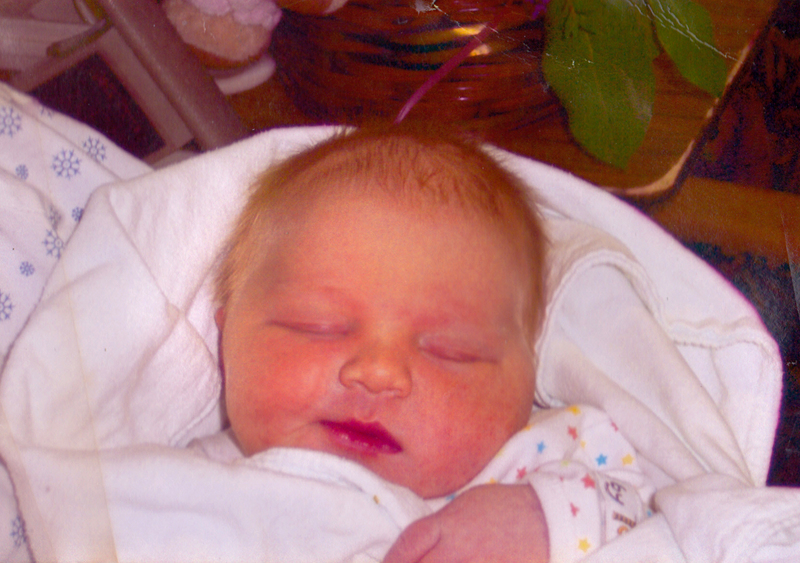 Her cheeks may have been chubbier, but she still looks like Autumn 🙂 Also, I was shocked to realize, I’ve been following you and your family for 2 years now! I remember you making her 6th and 7th cakes. How time flies! What a big girl! Very fun to see the photos through the years. 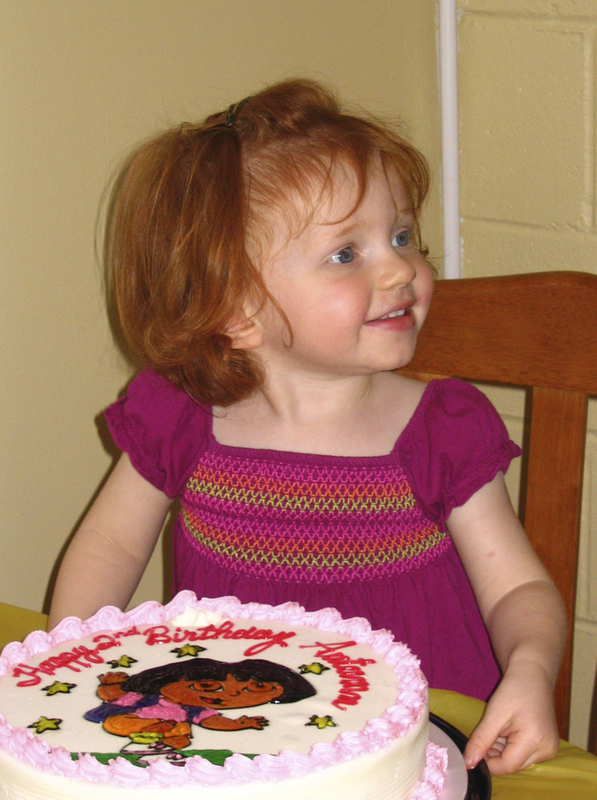 And the cake is so special. 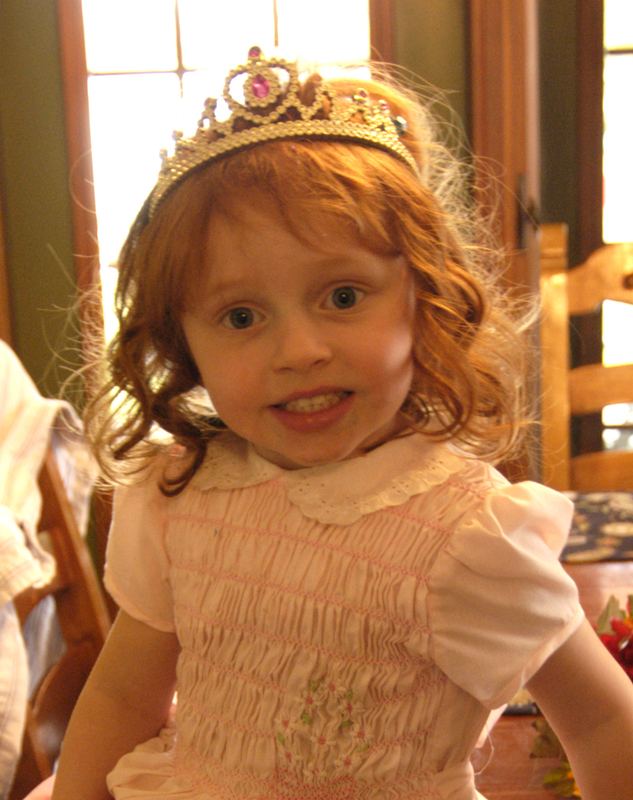 Happy birthday to Autumn! What a lovely cake! 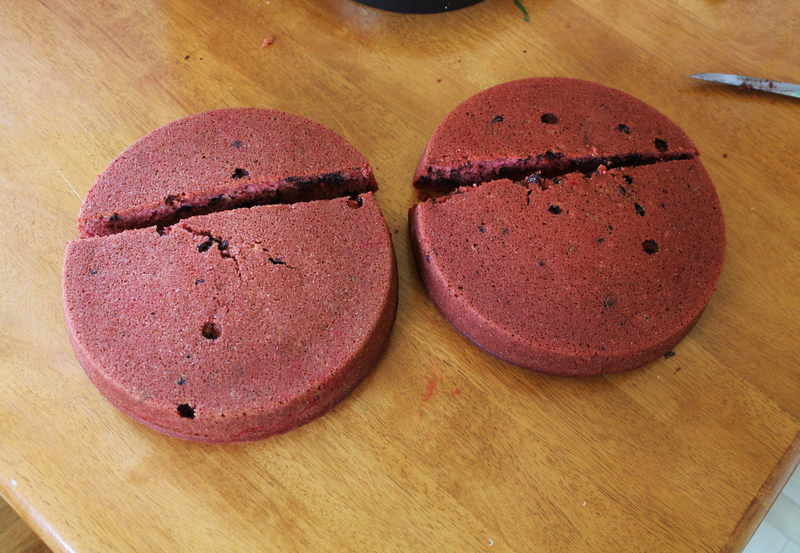 I´ve never made fondant, and I´ve not been able yet to make “buttercream” or other frostings look nice and smooth. Do you have a trick? 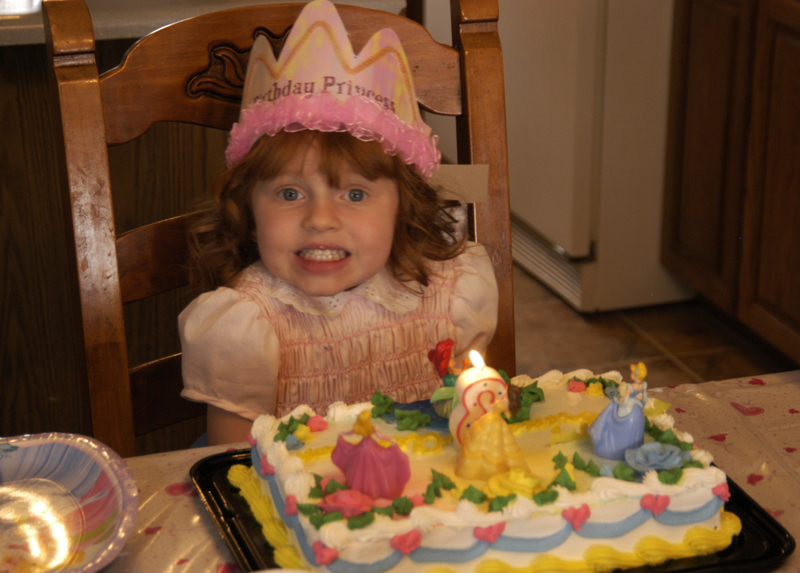 Love all her birthday pics through the years–what great cakes! 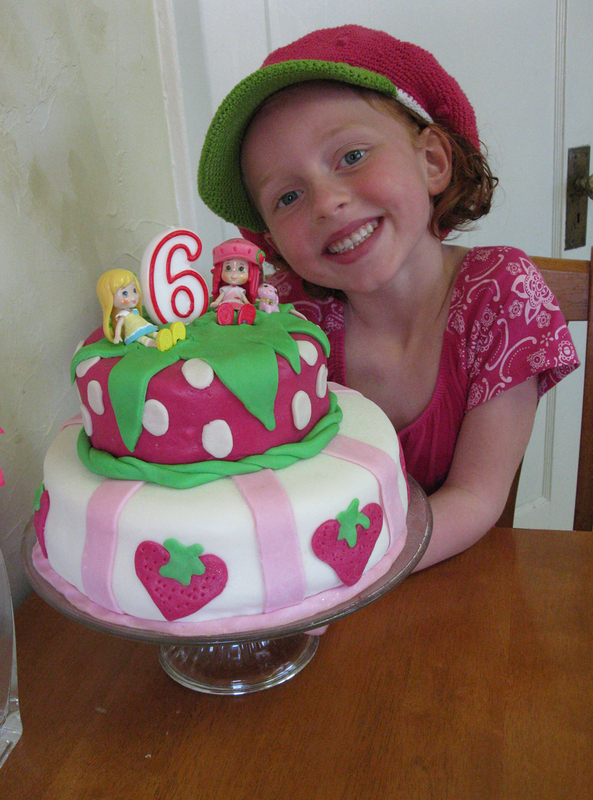 I love the Strawberry Shortcake one…is that sweet knitted strawberry hat handmade? Pingback: So Long 2012 | Live. Learn. Love. Eat. Sorry, I just do my own cakes. Pingback: Five | Live. Learn. Love. Eat.